Win a Sonos S5/ZoneBridge wireless music system! | What Hi-Fi? Win a Sonos S5/ZoneBridge wireless music system! Where multiroom systems were once seen strictly as the system-de-jour of the fabulously wealthy, Sonos realised that the 'convergence-convenience-and-store-all-your-media-on-a-hard-drive' generation might be crying out for something more affordable. And it turns out... they were. And with a small raft of products, there are an impressive number of options available. 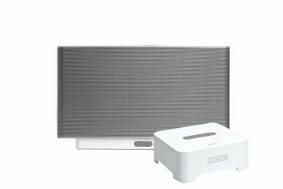 Our fantastic competition prize should be seen as a Sonos 'starter kit'. You simply plug the ZoneBridge into your router – wherever in your home that may be – then the S5 ZonePlayer (with its on-board amp and speakers) can be placed anywhere in the house. Simply turn it on, and it will communicate with your network via the ZoneBridge, which will stream your tunes to it seamlessly. And it sounds surprisingly good, too. That's why we're giving ten of these set-ups away, so you can sample the excellence of this system for yourself. Simply head on over to our competition page to enter, and one of these combos could be yours! See the Sonos website for more details.